Simply put: Apple doesn’t play by the rules. It reinvents them. The March 11, 2009, The New Yorker magazine features story, “How David Beats Goliath.” Writer Malcolm Gladwell could easily have written about Apple; his examples are 12-year-old girls basketball and T.E. Lawrence. Apple isn’t a team player. Since the company’s founding more than three decades ago, Apple has set its own rules, particularly under the two chief executive tenures of cofounder Steve Jobs. While Compaq and other clone upstarts sought to imitate the IBM PC, Apple defied it. The Macintosh’s graphical user interface, mouse and other features defied convention. The “1984” commercial launching Macintosh aired only once, bucking traditional marketing approach of repeated airings to build brand and product awareness. Apple bought out every single ad space in the Newsweek 1984 election issue—39 pages. Macintosh came bundled with Apple applications MacPaint and MacWrite. Apple’s business was at its worst, the company closest to expiration, during the early 1990s, when the company played more by rules established by Microsoft. Apple had put on Goliath’s mail and brandished his sword. For example, Apple embraced clones, allowing third parties to release their own hardware running Mac OS. The seemingly sensible strategy was anything but. Apple’s attempts to play by DOS/Windows PC rules put the company at grave competitive disadvantage. Steve Jobs’ late-1996 return to Apple and ascension to interim CEO in 1997 set forth dramatic changes in the company’s business strategy. Among Steve’s first actions: The end of Mac cloning. Only Apple would make and sell Macs. Streamlined product SKUs, from 1997 to present: Following Steve’s second coming, Apple reduced the number of products in each family. Example: Today there are three Mac notebook families, with three models in each of the MacBook and MacBook Pro lines and two for MacBook Air. Popular convention is to offer more product families and SKUs. The counter-culture approach lets Apple streamline manufacturing and distribution while maximizing margins. Bondi Blue iMac, released 1998: Some Windows PC OEMs offered all-in-one designs, but none like Apple, which dumped all the legacy ports for USB and FireWire. Hundreds of translucent products followed the design trend established by iMac. Apple Store, first opened in 2001: Apple moved into retail during a recession and while Gateway prepared to shutter, and later closed, hundreds of store. Everything about Apple Store, from design to retail staff training and more, defied computer retail convention. Genius Bar was a genius concept for servicing customers and endearing good feelings about Apple products. Goliaths Circuit City and CompUSA later liquidated. Apple Store is a vibrant retailer. iPod, launched in 2001: Apple redefined the nascent MP3 player market with the click wheel and hard-disk storage. Then Apple reinvented the device with iPod nano and again with iPod touch. Companies more typically seek to preserve the status quo they create. Apple has chosen to instead repeatedly reinvent iPod. iPhone, launched in 2007: Like David, Apple played to its strengths, such as software and industrial design, rather than play by rules established by handset carrier and manufacturing Goliaths. Examples include use of capacitive instead of resistive touchscreen, multitouch user interface, synchronization and control of software, software updates and services (rather than letting the carrier control them). Recessionary pricing, now: Apple pricing has long defied convention. The company prices high, choosing not to compete with Windows PCs in the sub $500 market. The approach preserves the brand’s value and margins. 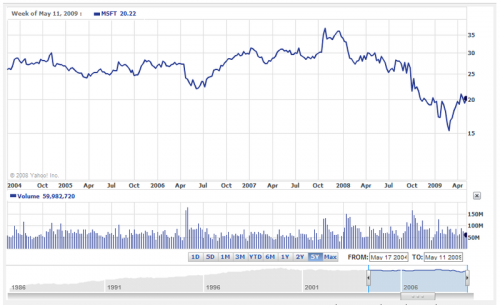 No time has Apple’s higher pricing been more obvious than during the current recession. So far, Apple’s rule-changing approach defies low-pricing logic. Price cuts are inevitable, I believe. But not now and certainly not massively. Microsoft cofounder Bill Gates admonished early developers in 1976 “An Open Letter to Software Hobbyists. The convention had been to share code, which he called stealing. Bill and other cofounder Paul Allen licensed what would later be called MS-DOS to IBM in 1981, rather than selling the software. The approach broke the end-to-end hardware/software model and later flourished a robust IBM PC-clone market. Microsoft’s approach to partnering, particularly software developers and resellers, put more money in others’ pockets. In the IBM model, money flowed up. By contrast, Microsoft shared the wealth. There are many other examples how Microsoft defied convention over the years, how the company changed the rules. No longer. Microsoft seeks to preserve the status quo. For example, top perennial design principle for Windows is backward compatibility. It’s the preservation of the past way of doing things. Similarly, Microsoft’s approach to enterprise computing is in many ways stifling rather than empowering. I’ll elucidate some time in the future. For now, suffice to say that, for example, Microsoft strategies around Business Intelligence or Unified Communications aren’t what they are claimed to be. These strategies extend the business process already in place—they preserve the status quo, whether the customers’ or Microsoft’s existing products. Outside-the-box, rule-changing before would lead to revolutionary processes, and with them new growth for all parties. Status quo thinking—rules established by Goliath—prevent Microsoft from being competitive and disruptive like Apple. But there are pockets of true innovation, of Davids changing the rules. Office 2007 is excellent example. Not only did Microsoft revolutionize the user interface, there was no fall-back option. Businesses couldn’t turn on the classic Office UI. Microsoft moved customers forward by defying some of its long established rules about backward compatibility. Guerrilla groups have produced some truly exciting new products, like WorldWide Telescope and—if it really works as promised—Azure Services Platform. David, let’s not forget, was a shepherd. He came at Goliath with a slingshot and staff because those were the tools of his trade. He didn’t know that duels with Philistines were supposed to proceed formally, with the crossing of swords…He brought a shepherd’s rules to the battlefield. Microsoft must leverage its strengths, battling Google in an unexpected way. But the how must be topic of a future post. By contrast, Apple has consistently competed, at least under Steve Jobs’ leadership, in ways that emphasize its strengths rather than complying with rules set by others. Should Steve not return from his medical leave next month, Apple’s challenge will be to keep up this David thinking. Apple’s rule changing is remarkable, given how much ridicule Goliaths have given.”The price that the outsider pays for being so heedless of custom is, of course, the disapproval of the insider,” Malcom writes. The disapproval is another Goliath tactic, of demeaning David for violating business cultural mores. Apple has long defied the criticism, which has put Goliath Microsoft on the defensive. Apple’s “Switchers” and “Get a Mac” marketing campaigns turned the attack and ridicule back to Microsoft. Who blinked first? Microsoft did with its “I’m a PC” Mac counter-marketing campaign. Microsoft’s mightiest weapon against Apple is marketshare measurement, although a newer tactic ridicules Apple product pricing (The so-called “Apple Tax”). Microsoft has long touted Windows PCs’ overwhelming marketshare lead over Macs. Gartner’s most recent PC shipment data put Apple’s US marketshare at 7.4 percent, which, by the way, declined over three quarters. But marketshare is not the measure of success. For public companies, return of profits to shareholders is the measure of success. During first calendar quarter Microsoft posted net income of $2.98 billion, or 33 cents a share. Apple delivered $1.21 billion net income, or $1.33 a share. A quarter earlier, Microsoft reported $4.17 billion net income and 47 cents a share; Apple net income of $1.61 billion and $1.76 a share. 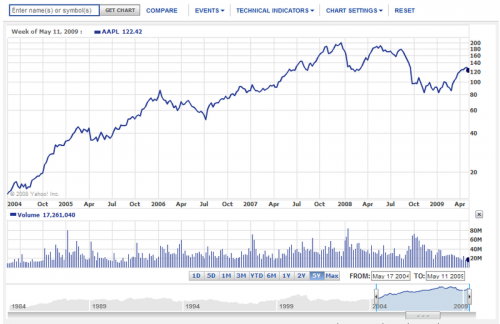 The two charts above, from Yahoo Finance, show Apple and Microsoft shares over five years through May 14, 2009. Which company’s shares would you rather own? Which company’s strategy looks better to you based on stock performance—Goliath and the status quo or David the upstart? I would rather own Microsoft stock. Microsoft has a major OS release that will succeed in this economic environment, while the only thing Apple has to look forward to unless it does more iPod stuff is declining margins. Microsoft also has many forms of revenue instead of just two, and isn’t at risk of losing a single super-manager (no, I’m not saying Jobs is unhealthy or something, I’m just saying there is only one of him, and irregardless of his replacability, the stock is directly related to his health in terms of price), as I’m sure people wouldn’t freak out if Ballmer’s enthusiasm for Microsoft somehow incapacitated him. Microsoft also has big names behind it, including Steven Sinofsky, Mark Russinovich, Ray Ozzie, Dave Cutler, Craig Mundie, Robbie Bach, Larry Hryb, Anders Hejlsberg, and this list isn’t an exhaustive one, just the ones I can recall. Apple has… what, Tom Cook? Apple isn’t a bad company, I just think this round of fighting with Microsoft will end somewhat badly for it. When has Ray Ozzie, ever, in his career, designed, or managed the design of software that humans actually want to use? But humans? He’s never designed anything that people want or like to use. As well, you forget some rather important names at apple. Tim Cook, Jon Rubenstein, Bertrand Serlet, Scott Forstall, Jonathan Ive, Bob Mansfield, Sina Tamaddon, and others. Just because you don’t know much about Apple, doesn’t mean it’s a doomed company. The article is right-on Joe. Apple is playing a totally different game to Microsoft. I think that Bill Gates saw the end of their business plan back in 1995 when he sent the internet tidal wave memo. 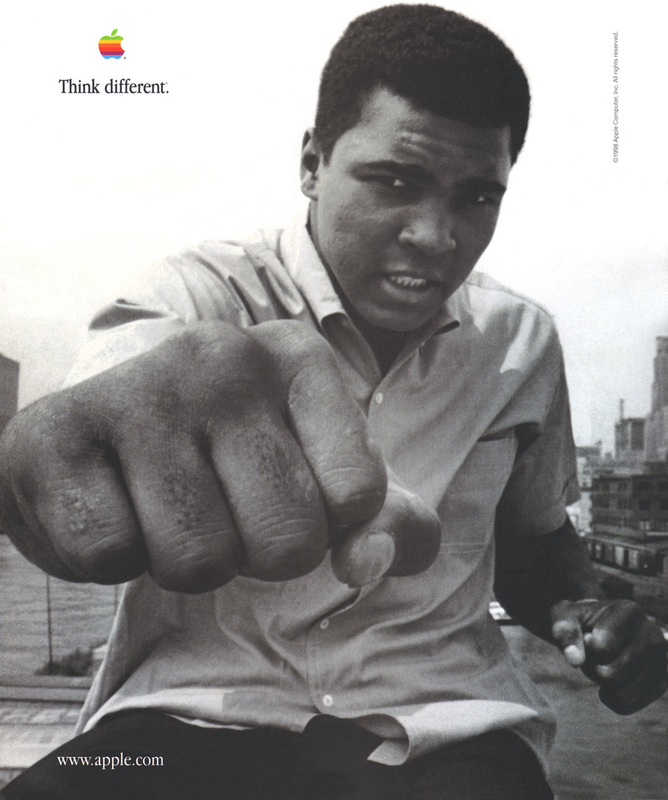 He was right, but he never managed to avoid it or diversify into other markets. XBox is their best bet, but it will soon need another couple of billion investment for the next generation. People will always need hardware to use the internet, and Apple makes much more than their hardware competitors. The one thing that nobody seems to highlight is that post 1997 Apple realised that content is king and content was it’s major barrier to adoption and that Apple has executed on that realisation pretty well. For the iPod and Apple TV there’s of course the iTunes store and brilliant idea of cataloguing external free content by means of the podcast directory within the iTunes store. For the iPhone there’s the iTunes store and the App Store. Things like the iPod click-wheel or iPhone multitouch are the bits of paper to light an initial fire, content is the big hefty log that keeps it burning. Apple isn’t even going up against Microsoft. Apple is moving in the opposite direction. MS wants users to buy cheap. Apple wants users to buy quality. I don’t think that Apple can every seriously compete with Microsoft. There are far more people in this world with lower standards that will buy low-priced products over expensive higher quality products. There are far more poor people in this world than those with plenty of money to spend. Any company that caters to the poor will automatically have a far greater market share. Think Nokia and Dell. Apple is basically catering to the elite who will always be in the minority. But does it really matter? I don’t care if all of the people in my neighborhood are happy to own $400 Windows PCs as long as I can afford to buy an OSX-powered Mac. Their choice is not my problem. Each individual has personal preferences. Apple and Mac computer market share seems to be destined to reach only 20% in the U.S., but that’s still a pretty decent number for Apple investors to shoot for and make money. So, while Apple will never win the outright war against MS, it will continue to win small battles for Mac, iPhone and iPod owners. Actually, the big battle right now is mobile computing and MS has fallen behind in a major way. Although they sold more WinMo licenses than Apple sold iPhones last year, Apple is already making billions in revenue off the iPhone while MS barely makes $250 million per year selling 20 million WinMo licenses at $8 to $15 a pop. And Apple’s secret weapon in mobile computing is the iPod touch. It effectively is doubling the iPhone OS user base with no interference from the telcos. No one else has anything like it. Apple achieved it’s success by rewriting the mobile rules. 3. Software development, marketing, deployment, purchasing is completely democratized, once again, completely independent of the telcos. 4. Apple makes money on every phase of the iPhone. Hardware, software, subscriptions, peripherals and retail sales in the own Apple stores. Microsoft has not really learned to make money off of anything but Windows and Office. Those two cash cows are subsidizing everything else. I absolutely agree. Apple completely changed the rules for mobile by taking control over the software platform and, more importantly, software updates. Now there is a single platform, single OS for all handsets, rather than the fragmentation common elsewhere. As for Office and Windows, they’re the status quo Microsoft preserves, which blocks out-of-box thinking. Apple isn’t catering to the elite with either iPod or iPhone. There, Apple is going mainstream. Mobile is the next-generation computing platform, which Apple caters to with App Store. Iphonerulez got nearly everything right except that Apple does not cater to the elite, they cater to the informed. Hey Yert: “Irregardless” is not a word. And it’s Tim Cook, not Tom. And MS’s value would likely go UP if Ballmer had to leave. Jobs has a great team of visionaries behind him. MS are just a bunch of suits who just don’t get it. Content that matters now, didn’t when Apple launched iPod. The device could succeed because people already had content, CDs they owned and ripped or music they ripped off from file sharing sites. Remember, it was about three years after iPod launched that iTunes Music Store was available to Windows users. Now, Apple has got superb content offerings with App Store and iTunes Store. The next 12 months will be make or break for both Apple and Microsoft. Apple faces tough tests of David character should Steve Jobs not return as CEO. Windows 7 could completely revive the Microsoft brand, driving sales of products in nearly every other category. But if Windows 7 flops, Microsoft’s slow decline will begin–unless Azure is as good as, or even better, than promised. John Rubenstein is at Palm now, preparing the Pre. Actually they are still targeting the elite even with the iPhone. Mainstream are the free phones, or the $29 or the $100 mobile phones, not a $300+ phone with data usage etc. on it. Still the elite of the mobile world. Excellent points all but it should be pointed out that MS only knows how to win when it can define the battlefield … winning enterprise because they can find the decision makers or buying out competitors and when you needed a build a staff to launch anything – MS could either buy or replicate you but now, in an era where Mozilla has thousands of “free” programmers – MS cannot compete with Firefox anymore nor of course, can Ms control distribution now with the internet. Whereas before they could literally buy up or lock in deals with the 4-5 major distributors – now, Apple or anybody can eat MS’ lunch and often does. MS is done as a innovator – full of people fired by other comapnies and just bureacrats left. That first guy counting on MS an investment is just fooling himself. They are a fine enterprise software company but Lucent, they should stick to their strengths instead of trying to pretend they are a consumer company … as a shareholder you should wonder why the enterprise pours cash but the consumer side has lost about $35 billion in the last 10 years of YOUR equity and the $20 billion spent to shore up Gates & ballmer’s holdings … MS has had ZERo successes in the last 10 years (webTv, MSN, MSN seach, WINCE, watches OS, auto OSes, Bob, Vista, Zune, etc, etc …) MS is clueless. (BTW, the Xbox division is still $15 billion in the red AND AOL made money on the internet last year, MS lost $700 million – $700 Million! Fact the facts, they’ve been coasting since 1998 and will be lucky to survive 10 years if they don’t just go back to their strength). Aww, come on. There is no such word as “irregardless.” Even the writers of the TV show, Medium, wrote about it in last week’s script. Where did you get this word, anyway? What do you think it means? And, by the way, Windows 7 might be just Service Pack #3 (or 4). A techie found that designation in a Windows .DLL file. So really, for this and because Ballmer said that it’s just Vista with enhancements, it should be called Vista 2. There is nothing wrong with naming it Vista 2. No one should be ashamed of using it as it has achieved a measure of recognition. Therefore, it should not be priced as a new OS. Apple has a lot to look forward to. You don’t have to like Apple, but just look at the fundamentals. No legacy hardware and software. Apple will continue to redefine our tech world for the foreseeable future. Microsoft is in a world of hurt. They are going to have to start spending some of that 25 billion they have or start laying off large amounts of staff (which has already begun) to continue to operate. Apple defines it’s own universe. Apple does not play in Microsoft’s world. They are not even in the same quantum reality as MS. Apple at every turn has made an embarrassment out of Steve Balmer and microsoft. I also find it very funny that Office for Mac is Still far superior to that of the windows version. I use it everyday. I love how Apple makes products I can “use” day in and day out and not have to work “on” just to keep it alive. The next ten years will be very very interesting. I agree, this is why the iTunes+iPod line they pushed and advertised heavily was Rip. Burn. Sync. back then. The point is their focus for longterm success is on the content. Not to mention that back then iTunes’ CD ripping, auto-CDDB lookuping, auto-ad to library-ing and thus autosync to iPod-ing was pretty much the slickest in town. ORIGIN early 20th cent. : probably a blend of irrespective and regardless . USAGE Irregardless, with its illogical negative prefix, is widely heard, perhaps arising under the influence of such perfectly correct forms as: irrespective. Irregardless is avoided by careful users of English. Use regardless to mean ‘without regard or consideration for’ or ‘nevertheless’: | I go walking every day regardless of season or weather. Might I suggest the use of the word, irrespective? Joe, it is improbable that Windows 7 will flop. There is a good deal of pent up demand. 7 won’t succeed without some measure of irony, it really isn’t substantively different from Vista – saying Vista is quite good and that 7 isn’t quite as good as many have made out. On modern hardware, I have not been able to distinguish between the two in terms of performance. Vista x64 is especially good and in many ways, better than Windows 7. Apple will do well. There is enough market for them to continue to please their customers. If they get much larger, they’ll get hammered on the security front. They have real issues in that context and they need to address them. Irrespective of how the ITMS has evolved, it has to be said that the iPod gained great popularity, as Joe suggests, because of the rampant, wholesale theft of music and copyrighted video by millions of people. Apple benefitted greatly from the billions of downloads that filled nearly every iPod. Stolen content propelled the iPod to where it is. is closing in for the kill. They’re pretty darn good at playing dead. Almost fooled me. The reason Windows 7 is looked on as the savior of the company is because Microsoft hasn’t had a hit product since XP. But people aren’t going to flock to it like they have the iPhone because it’s more of the same to them. Most people already HAVE a usable Windows OS at home. They’re not all going to rush out and pay $300 get ful blown W7 for a $600 computer. In fact MS will probably bumble again by releasing 3 different versions of the OS and confuse customers into saying screw it, and waiting until they update their hardware — most of which has worked good enough. They’re more likely to be pinching their pennies in these times. Really, the cash cow that has been MSes OS sales has been milked. W7 will just squeeze out a bit more. On the flip side I can see most mac users upgrading their OS for $130 for a $1000-$3000 machine the bought less than 3 years ago or replacing their Machine they bought over 3 years ago entirely. Microsoft doesn’t see nearly as many pennies from hardware sales as Apple does. Mac users are willing to spend a few hundred to extend the life of their machine a few years. W7 on the other hand obsoletes more hardware than it extends. There’s a a very good reason their is a 10% premium for Macs — it’s called a great, rock solid, secure-out-of-the-box OS. That’s bull. Music was going digital no matter what. Most of the people I know with an iPod paid for their music, either on CD or through download services like iTMS. Why? Well, 20 years of CD sales and the computers with the ability to rip these tracks led to the success of the iPod. Sure there are people out there that stole a good deal of their music — most of them I know as Windows users, honestly, but you don’t see Zunes taking off because of it. They’re separate things. After choking on some of the stuff you’ve written for your “Apple Watch” column, this comes across as a surprisingly well though-out appraisal. My comment: it doesn’t really matter what happens with Windows 7. If it does well, it will only serve to accomplish what Microsoft should have accomplished with Vista. That is, convince it’s own faithful to upgrade from a 7 year-old OS. However, with it’s recent campaign, they’ve backed themselves into a corner by painting themselves as the cheap alternative to the Mac, and they’ve dragged their PC manufacturer partners into this quagmire along with them. This is what they will now and forevermore be – cheaper than a Mac. Not better, not even on par, just cheaper. This, regardless of the success of Windows 7. It plays OK in a recession, but the recession won’t last forever. Agreed – market share is not the issue for Apple. They’ve already proven they can sustain profitability on less than 10% market share (it’s surprising how many pundits just don’t get that). Goliath is now playing by David’s rules. MS is providing Apple the kind of brand awareness that they could never hope to generate with a thousand “Get A Mac” ads. I also believe that the culture of David has become so thoroughly ingrained at Apple that it will survive Jobs departure. Also, none of us know what sort of redefinition Apple is about to spring on the low end with it’s answer to the netbook. I think this kind of headline might qualify for the stupidity part of your tagline. Do you work on Wall Street? MSFT should be worth about $5 a share. You may still choke on some of what I write, Steven. But there should be a qualitative change in the writing. What you will read here more reflects what I think. At Apple Watch, in role as reporter, I often suppressed my own viewpoint. That said, the analysis here also will be based on facts. Sometimes the conclusions will go places I don’t like, but that’s what I’ll write. So not everything will reflect my viewpoint–just more than before. “Office for Mac is Still far superior to that of the windows version” ???? I have used Office on Windows a number of times and didn’t find the same drawbacks (though I don’t use it every day, so there may be some issues I’m not aware of). Now I agree that Mac is overall much better than Windoze, but I would certainly not hold MS Office Mac up as an example of a good app on Mac! Author, Seth Godin, wrote a short post on hig blog titled “Luxury vs Premium”. He was not talking about Apple or Microsoft specifically but he made some very valid points. The link did not get posted in my earlier reply. That post is short and sweet, but good reading. So are Apple luxury or premium products? And does it even matter in this economy?